Color/Pattern - Glasses come in so many different colors and patterns that it can get overwhelming after a while. 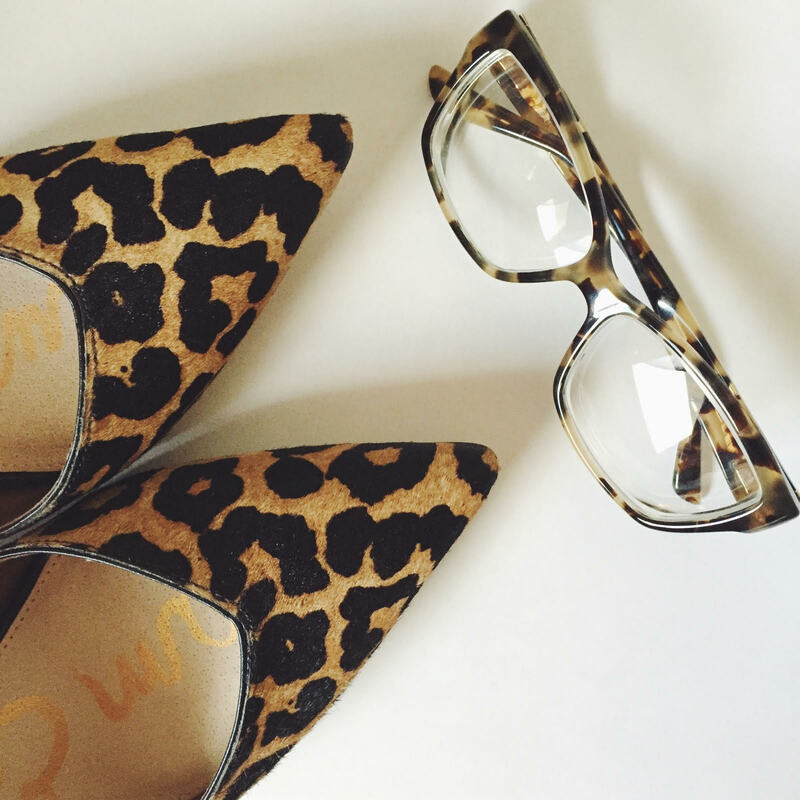 If you're going to be wearing your glasses on a daily basis then I recommend sticking with black, brown, or even leopard (leopard can be a neutral!) in order for your glasses to go with all of your outfits. If you're like me and only wear glasses out in public every once in a while, then feel free to go bolder with your choices. Also, hair color and eye color plays an important role in glasses. Since my hair color is lighter, I decided on leopard glasses which would accentuate the blonde in my hair. For gals with dark hair or even green/blue eyes, try purple, teal, or even a red pair of glasses which would brighten your face and accentuate your eye color. Shape - Ever wonder why certain glasses just don't look right on your face? It's all about the shape of them! Since I have a round face, I've noticed frames that are square or rectangular seem to be more flattering than round shapes which would accentuate my round face. If you have a petite face with great cheekbones then I recommend going for a rounder shape that would soften your look. Overall, I recommend trying out glasses in all shapes and sizes in order to understand what's flattering. Style - During my lazy days which is usually the days that I wear my glasses (other than at home), I want my glasses to represent my personal style. If you're someone that's not into fashion, then go for a more simple classic black pair. If you're into trends, then go for the latest quirky style that Prada has out. Your glasses are simply another way to express yourself. Buy Them Online - I used to always buy my glasses from Lenscrafters and pay a ridiculous amount of money for good quality glasses yet lately I've been getting bored of the same old designs so I decided to shop online. I ended up falling in love with a designer pair on Amazon that I never would've found where I live and the best part is that I paid half price! I ended up saving a lot of money and most places have free returns/exchanges just in case you don't end up loving them.